Great apes – orangutans, chimpanzees, bonobos and gorillas – realize that they can be wrong when making choices, according to Dr. Josep Call from the Max Planck Institute for Evolutionary Anthropology in Leipzig, Germany. Dr. Call's study was just published online in Springer's journal, Animal Cognition. In a series of three experiments, seven gorillas, eight chimpanzees, four bonobos and seven orangutans, from the Wolfgang Köhler Research Center at the Leipzig Zoo in Germany, were presented with two hollow tubes, one baited with a food reward, the other not. The apes were then observed as they tried to find the reward. In the first experiment, the apes were prevented from watching the baiting but the tubes were shaken to give them auditory information about the reward's location instead. Dr. Call wanted to see if when the apes were prevented from acquiring visual information, but offered auditory cues instead, they would be able to use the auditory information to reduce their reliance on visual searching. 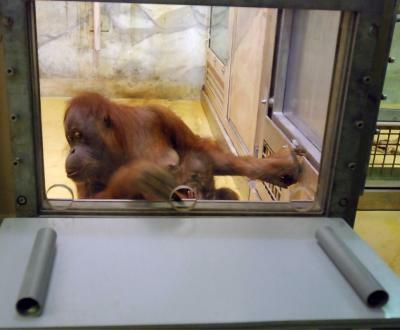 In the second experiment, the apes were shown the location where the food was hidden and then at variable time delays encouraged to retrieve it. The purpose of this experiment was to see if forgetting the location would lead to the apes looking harder for it. In the last experiment, the researcher compared the apes' response between visible and hidden baiting conditions, when the quality of the food reward varied. The author hypothesized that the apes would check more often when a high quality reward was at stake, irrespective of whether or not they had seen where it was placed. Although the apes retrieved the reward very accurately when they had watched the baiting, Dr. Call found that they were more likely to check inside the tube before choosing when high stakes were involved, or after a longer period of time had elapsed between the baiting and the retrieval of the reward. In contrast, when the apes were provided with auditory information about the food's location, they reduced the amount of checking before choosing. According to Dr. Call, taken together, these findings show that the apes were aware that they could be wrong when choosing. Dr. Call concludes: "The current results indicate that the looking response appears to be a function of at least three factors: the cost of looking inside the tube, the value of the reward and the state of the information. The combination of these three factors creates an information processing system that possesses complexity, flexibility and control, three of the features of metacognition*. These findings suggest that nonhuman animals may possess some metacognitive abilities, too."